While there is no standard for counting by 5s to 100 in kindergarten, you may want to jump the gun a bit and give the kids who seem ready for it an extra challenge. You can use these worksheets as assessments, too. 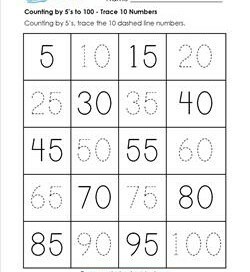 To count by 5s to 100, kids trace the numbers, write on the lines, or fill in the empty boxes. 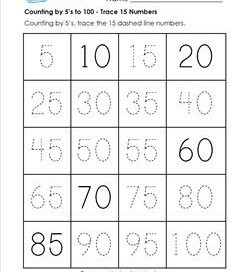 You can pair these worksheets with these skip counting by 5’s to 100 worksheets. Please go to this page to see more kindergarten counting worksheets. 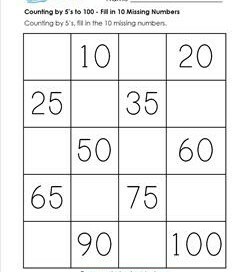 Kids can practice saying all the numbers on this counting worksheet but they only need to trace 10 of them. Great for starting to count by 5 & number writing. 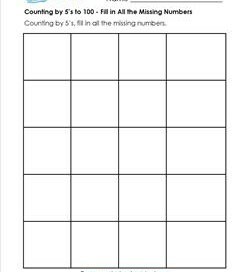 Kids get to trace even more numbers in this counting worksheet – fifteen to be exact! Five numbers are already provided in dark print. 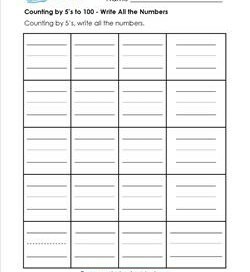 Kids trace all the numbers from 5 to 100 in this counting to 100 by 5’s worksheet. Great number writing practice as well as confident counting practice. 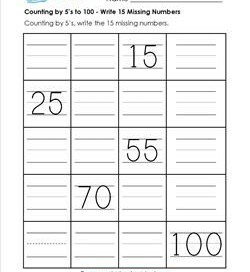 Primary writing lines are provided in this worksheet so kids can practice writing their numbers in a neat and orderly way while counting to 100. Counting by 5’s to 100 is getting a little harder. But no fear, some numbers are provided to help kids remember their place in the counting sequence. 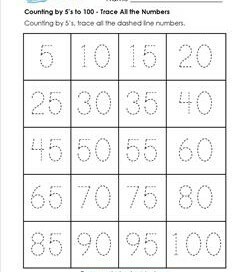 Here is a counting by 5 worksheet where kids get to write all the numbers from 5 to 100. Writing on the lines helps kids slow down & write carefully. 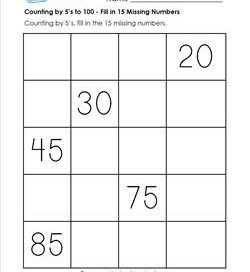 This counting by 5’s worksheet allows kids to count and write the missing numbers without having to worry about writing neatly. 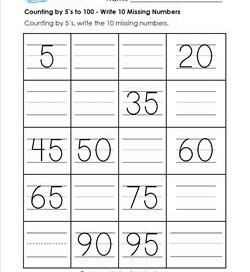 The blank boxes on this counting worksheet are for filling in the missing numbers from 5 to 100. Five numbers have already been provided. No helps in this count by 5’s worksheet. Kids write ALL the numbers in this counting sequence. Can they do it? I bet they can!